DA Form 67-10-3 otherwise called the Strategic Grade Plate (O6) Officer Evaluation Report is used within the Department of the Army (DA) to provide the DA Headquarters (HQDA) with useful and valuable information about the competence, mental and physical condition and potential for promotion of an officer. The DA 67-10-3 is used when evaluating colonels. The DA-issued form was revised in November 2015 and is valid and in use today. 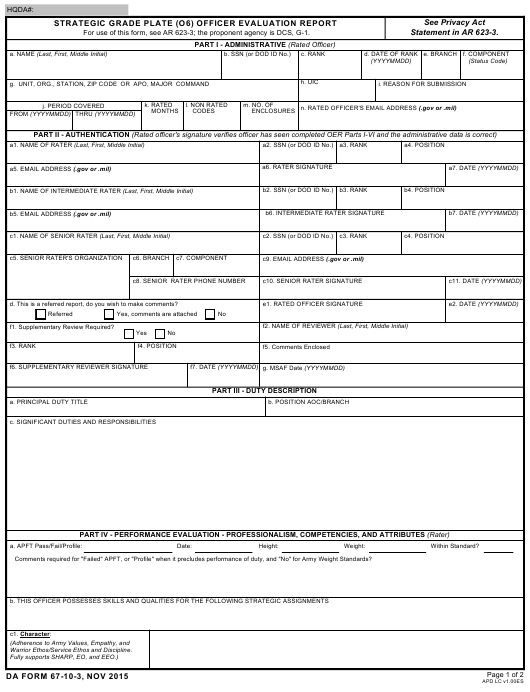 An up-to-date fillable DA Form 67-10-3 is available for download below. The form - sometimes referred to DA Form 67 for short - should not be confused with the DD Form 67, Form Processing Action Request which is used to request a revision or cancellation of an existing form in the DoD inventory or to add a new one to the Army database. What Is DA Form 67-10-3? The United States Army introduced a new officer evaluation system on April 1, 2014. The new DA 67-10 Series presents a new format of evaluation to analyze and rate officer performances more precisely and in line with Army doctrine. The DA Form 67-10-3 and other reports in the series replaced the DA Form 67-9, which was universal for all officers despite their rank. The report is prepared by the rating chain, which consists of a rater and senior rater. An intermediate rater may also take part in the evaluation. The process of officer evaluation includes supervision, performance evaluation, writing a self-assessment and a face-to-face interview with the raters. The DA 67-10-3 is forwarded to the Department of Army Headquarters (HQDA) upon completion. Warrior Ethos/Service Ethos and Discipline. Part I, Administrative data is used to identify the rated officer and provide unit data and information on the number of rated months, the period covered, the reason for submitting the report and non-rated time codes. Part II, Authentication is for the rated officer and rating officials to sign after the SGP-OER has been completed at the end of the rating period. Part III, Duty Description provides an overview of the rated officer's tasks and responsibilities and is filed by the rating officials. Part IV evaluates the professionalism, competencies, and skills of the officer as well as their adherence to attributes and core leader competencies. Part V is only filed by an intermediate rater if they are participating in the rating process. Part VI is the senior rater's assessment of the potential of the officer. This part is intended to capitalize on the senior rater's experience and valuable organizational perspective. DA Form 67-10-1A or the Officer Evaluation Report Support Form is a form used for assisting the rating chain and the officer in preparing the evaluation report. This form has six areas of assessment: character, presence, intellect, leadership, development, and achievements. The rated officer fills it at the beginning of the rating period and submits it before the face-to-face interviews. DA Form 67-10-1, Company Grade Plate (O1-O3; WO1 - CW2) Officer Evaluation Report is a performance reporting form similar to the DA 67-10-3 that is used when evaluating first and second lieutenants, captains, warrant officers one and chief warrant officers two. DA Form 67-10-2 or the Field Grade Plate (O4-O5; CW3-CW5) Officer Evaluation Report is used to evaluate officers ranked major, lieutenant colonels, and chief warrant officers levels three to five. DA Form 67-10-4 (Strategic Grade Plate General Officer Report) is another reporting form used for evaluating generals' performance.